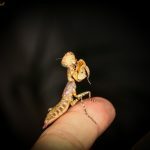 This species is very new to the hobby, and therefore is much sought after….but also, very little is known or documented about its behaviour and requirements as a captive mantis. It can be found in various parts of Africa, including; Somalia, Ethiopia, and Kenya. They are very aggressive hunters, with bulky, strong arms. Adults can reach ~2″ in length. The like to stay on bark or branches, hugging them closely, so it is advisable to have plenty of thin or narrow winding sticks and branches for them to hide behind.